As the Bernice Summerfield range moves on to its third novel adaptation to continue developing its charismatic new lead as so naturally and wonderfully played by Lisa Bowerman, Bernice is surprised when Jason shows up to visit her at St Oscar’s with one of the People in tow. With the People being one of the of most powerful races in the universe but not possessing time travel capabilities, she’s not overly surprised when this social visit turns out to have the more furtive underlying purpose of uniting the two time rings of Jason and Bernice, allowing the People to create a Time Path back to ancient Babylon in an incredibly audacious plan that eventually threatens time itself. 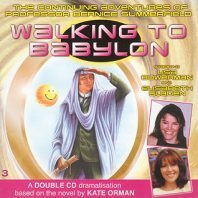 Superficially, ‘Walking to Babylon’ follows the same narrative structure as the preceding ‘Beyond the Sun’ where Jason appears while in trouble, gets kidnapped, and needs Bernice to save the day, but the detail afforded the settings, aliens, and plot makes this a much more thorough and rewarding experience overall. Without going into too much detail to risk alienating new listeners, the People were once involved in a great war with the Time Lords that ended with both races agreeing not to infringe on each other’s territory. Though most People are content with this treaty, two renegades have taken it upon themselves to travel into established history with the risk of nullifying the treaty, and Bernice has only forty-eight hours to find Jason and stop the rogues before the frightened People of the present send a bomb down the Path to destroy everything at the other end to maintain the status quo. ‘Walking to Babylon’ is a spectacular showcase for the incredible intricacies of Bernice, and the emotion-fuelled introspection about why she finds it so difficult to relax around the man who left her and why she still snaps at him so easily is incredibly deep and poignant. She implicitly understands the sanctity of the laws of time and is willing to sacrifice her own life to uphold them, stating to herself that she will remain in Babylon if she fails for fear of letting everyone down. She’s brave and resourceful, and she reveals through a harrowing story just why she is always prepared to be stranded and self-sufficient, but it’s her burgeoning relationship with John Lafayette from the nineteenth century who accidentally found his own way onto the Path as well that forms the true emotional crux of the tale. Barnaby Edwards brings the more traditional morals of that era to life perfectly as John, and his immense chemistry with Bowerman makes their rapidly intensifying bond based on love and protection sparkle from the outset despite the increasing danger around them. Stephen Fewell again impresses as the mischievous Jason who understands the power he retains over Bernice but completely misjudges his life decisions in general, but in a fairly small supporting cast it’s Elisabeth Sladen as Ninan-ashtammu with her lust for adventure and Steven Wickham as the attitude-laden drone who shine even brighter and give a distinct energy to proceedings that never falters. Still, this is a production that excels on all fronts, and the sound design brings ancient Babylon to life with incredible detail and nuance. With the race against time providing an innate danger and tension from which not everyone can escape unscathed, only the rather preposterous notion of these two People trying to rekindle the war with the Time Lords to teach their own people humility fails to profoundly resonate. Yet with plenty of emotion and heart to fuel this fantastic adventure, ‘Walking to Babylon’ proves that this is absolutely an audio range that can continue to deliver on all fronts and become a long-lasting success.